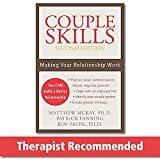 In Couple Skills, three established authors in the self-help field, including two psychologists and a frequent writer on mental health topics, offer a skills-based manual for improving relationships. The authors argue that their approach is unique in that it focuses on action and change, thereby requiring the active involvement of the reader. Furthermore, they have designed each chapter of the book to stand alone, thus allowing readers to pick and choose the sections of the book which are most personally applicable. To facilitate this, the Introduction includes a "Problem Chart," a checklist designed to help couples to identify the main issues in their relationship. Based on the results of this brief assessment, the chart suggests the specific chapters/skills which are likely to be most useful to a particular couple or individual reader. The book is organized into several sections, starting with Basic/Advanced Skills and then moving on to more complex concerns, with segments on Anger and Conflict as well as Understanding and Changing What Goes Wrong. The Basic Skills mainly cover fundamental communication strategies including listening, expressing feelings/needs, and providing reinforcement. The Advanced Skills chapter builds on these preliminary strategies by introducing the principles of "clean" (responsible) communication as well as explaining the concept of cognitive distortions. The remaining chapters in this section cover two essential couples communication skills, negotiation and problem-solving. The final two segments of the book focus more on problematic styles of interaction. For example, the section on anger addresses how to cope with both anger experienced by self and anger from a partner, the latter of which centers around assertiveness techniques. Understanding and Changing What Goes Wrong is designed to help readers identify ongoing negative patterns in their relationships; topics here include schemas, "old tapes" or distortions of partner based on past, defenses, expectations, and couples systems. The main strength of this book is its practical approach. Every chapter contains a wealth of helpful case examples, interactive worksheets, and constructive couple exercises. However, as the topic areas addressed become more complicated, so do the interventions, thus demanding an even greater level of participation from the reader. As the authors say in their introduction, this book is designed for couples who are willing to work; there must be a real commitment to engaging fully in the activities suggested in order to derive benefit. As mentioned above, the authors also stress that they chose to concentrate on offering skills necessary for change rather than presenting concepts and theory. Despite this, each chapter begins with brief views of both the origins of and the theoretical background for the ideas and techniques presented in that segment. Although these comments on history and supporting evidence are generally brief, they seem unnecessary and serve to interfere with the flow of the book. Finally, the manuscript would've benefited from more a more vigorous editing process pre-publication, as I came across several typing and formatting errors. For couples who share joint motivation to work on their relationship and who are willing to put in both the time and effort required to learn and practice the skills set forth here, this book is likely to be useful and informative. However, those who feel more ambivalent towards their partners and/or are looking for a quick fix are likely to be disappointed in work-intensive approach necessary to obtain benefit from this skills-focused guide.